We manufacture engraved nameplates for equipment and electrical panels. These nameplates can be mounted with adhesive or screws. For harsh environments or military applications, see our aluminum nameplate section. Below are listed our standard sizes and colors, but we can also make custom sizes and colors. Includes 3/16" letters on 1/16" thick plastic tags. See Mounting methods for adhesive and holes prices. See our discounts listed below for larger size orders. 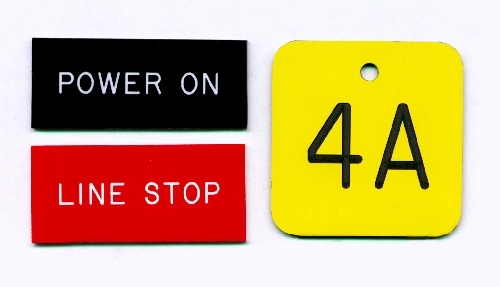 Unless otherwise specified, tags will be shipped with thin tape.